FC Dallas' Bobby Warshaw (16) tangles with Tigres' Jesus Alberto Duenas (29) during a during a Major League Soccer match at Pizza Hut Park in Frisco on Sept. 3, 2011. 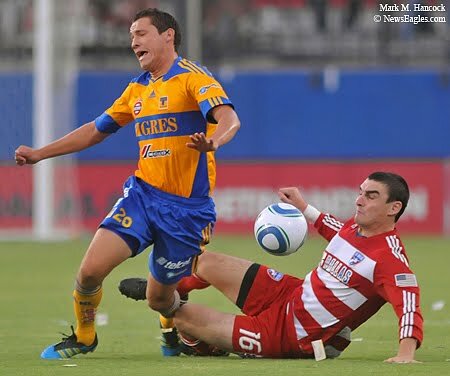 FC Dallas battles the Tigres during a Major League Soccer match at Pizza Hut Park in Frisco. Named in this slideshow are: Bobby Warshaw, Jesus Alberto Duenas, Ruben Luna, Jorge Luis Valencia, Manuel Viniegra, Moises Hernandez, Danilo Veron, Lucas Armando Lobos, Chris Seitz and Danilo Veron. FC Dallas' Maicon Santos (9) pushes Seattle's Lamar Neagle (27) away from the ball as Zach Scott (20) approaches during a Major League Soccer match at Pizza Hut Park in Frisco on Aug. 20, 2011. 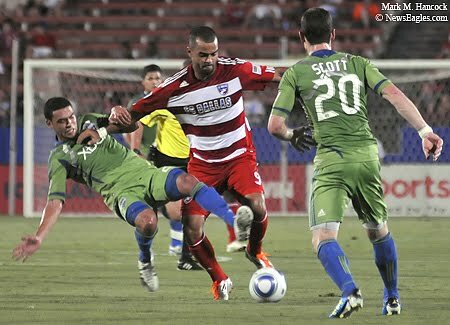 FC Dallas battles Seattle during a Major League Soccer match at Pizza Hut Park in Frisco. Named in this slideshow are: Hooper, Erin Riley, Jackson Goncalves, Lamar Neagle, Ricardo Villar, Daniel Cruz, Marvin Chavez, Leonardo Gonzalez, Brek Shea, Kasey Keller, Maicon Santos, Jeff Parke and Erik Friberg. 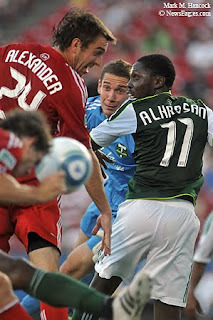 FC Dallas' Zach Loyd (19) sneaks in for a header goal as Portland's Kalif Alhassan (11) and goalkeeper Troy Perkins (1) are occupied with Eric Alexander (24) during a Major League Soccer match at Pizza Hut Park in Frisco on June 25, 2011. 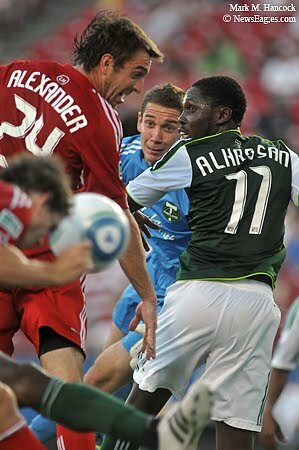 FC Dallas battles Portland during a Major League Soccer match at Pizza Hut Park in Frisco. FC Dallas won 4-0. Named in this slideshow are: Andrew Jacobson, Darlington Nagbe, Jackson Goncalves, Diego Chara, Zach Loyd, Eric Alexander, Rodney Wallace, Mamadou "Futty" Danso, Kevin Hartman, Brek Shea, Kenny Cooper, Eric Brunner, Kalif Alhassan, Troy Perkins and Ugo Ihemelu. FC Dallas' Marvin Chavez (18) threads the ball between Philadelphia's Danny Califf (4) and Carlos Valdes (5) during a MLS soccer match at Pizza Hut Park in Frisco on May 14, 2011. FC Dallas battles Philadelphia during a MLS soccer match at Pizza Hut Park in Frisco. Named in this slideshow are: Brek Shea, Sheanon Williams, Carlos Valdes, Zach Loyd, Danny Mwanga, Fabian Castillo, Danny Califf and Marvin Chavez. Stars' Krystofer Barch (13) is thrown to the ice by Coyotes' Paul Bissonnette (12) during a NHL hockey game at American Airlines Center on Dec. 26, 2010 in Dallas. The Dallas Stars battle the Phoenix Coyotes during a NHL hockey game at American Airlines Center on Dec. 26, 2010 in Dallas. 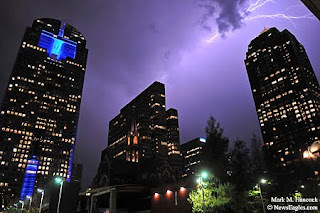 Named in this slideshow are: Jamie Benn, Ed Jovanovsk, Brandon Segal, Vernon Fiddler, Loui Eriksson, Scottie Upshall, Jason LaBarbera, Mike Ribeiro, Kari Lehtonen, Krystofer Barch, Paul Bissonnette, Brenden Morrow, Sami Lepisto, Ray Whitney. 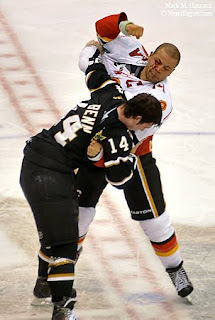 Calgary captain Jarome Iginla (12) tries to see through the blood to land a counter-punch on Stars' Jamie Benn (14) during an NHL hockey game at the American Airlines Center on Dec. 23, 2010 in Dallas. Calgary battles the Stars during an NHL hockey game at the American Airlines Center on Dec. 23, 2010 in Dallas. Named in this slideshow are: Miikka Kiprusoff, Mark Giordano, Kari Lehtonen, Matt Niskanen, Matt Stajan, Tom Kostopoulos, Jamie Benn, Jarome Iginla, Steve Ott, Niklas Hagman, Curtis Glencross, Mike Ribeiro, Robyn Regehr, Jeff Woywitka and Brendan Morrison. 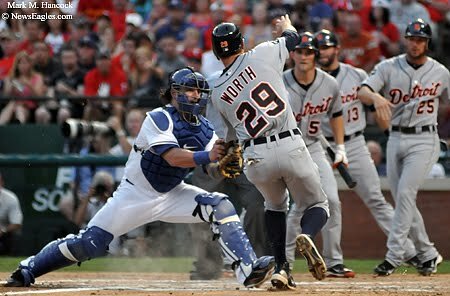 Rangers' catcher Mike Napoli (25) tags out Tigers' Danny Worth (29) at the plate during a Major League Baseball game at Rangers Ballpark in Arlington on June 7, 2011. 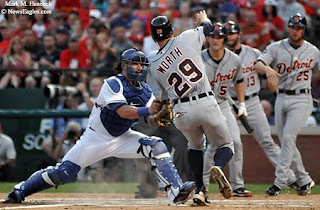 The Texas Rangers battle Detroit's Tigers during a Major League Baseball game at Rangers Ballpark in Arlington. Both teams eventually advanced to the current division series. Named in this slideshow are: Mike Napoli, Danny Worth, Josh Hamilton, Austin Jackson, Mitch Moreland, Casper Wells, Brennan Boesch, Miguel Cabrera, Mike Maddux, Matt Harrison, Ron Washington, Ed Hickox, Dave Bush, Ian Kinsler, Jhonny Peralta, Ryan Raburn, Mark Lowe and Yoshinori Tateyama. U.S. PJs take media law courses in college to learn their rights and responsibilities. In the past, I've considered it redundant to post this information on this blog. However, after a particularly annoying incident today in a public park, I've determined many people are either ignorant or are just control freaks. 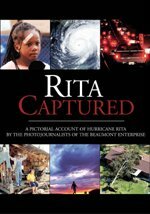 So, here is a link to the ACLU's "Know Your Rights" post for photographers (it covers the same information posted in 2005). In general, if you are standing on public property and not impeding emergency or police activities, you can shoot whatever you can see. It's a Constitutional right for every person standing on U.S. public property. There's no debate. If you don't want photos of yourself or your objects, don't be within plain sight of public property. The Constitution is the basis for - and thereby trumps - all other laws.